Since 2010 The Woolmark Company, the world-wide authority on wool, has engaged a global repositioning plan with the objective to relaunch the prestige of the Woolmark brand and increase the knowledge, appreciation and demand of Australian Merino wool across international markets. 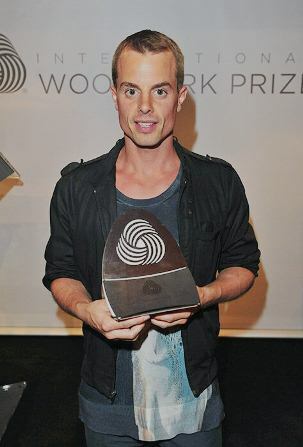 A significant part of this strategy is the relaunch of the Woolmark International Prize. 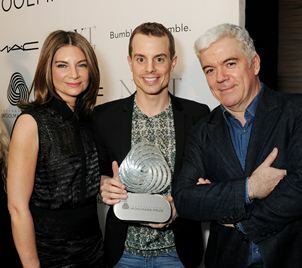 The Prize recognises and encourages young fashion designers who work in wool. The list of past recipients include names such as Karl Lagerfeld and Yves Saint Laurent. I have been delighted to be commissioned by Australian Wool Innovation to create the Woolmark International Prize Trophy and the preceding Regional Trophies. 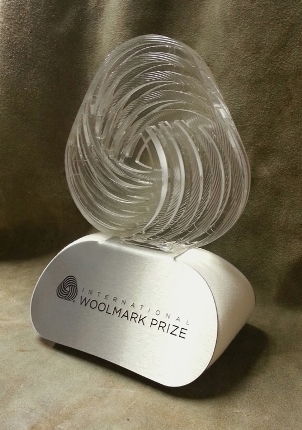 The Woolmark International Prize Trophy featues the highly recognised Woolmark logo, designed by Italian graphic artist Francesco Saroglia and launched in 1964. I used CAD software to design this two dimensional logo into a three dimensional object. This digital work was then realized using CNC machining to cut the new design from a 50mm thick acrylic panel. The acrylic was then polished and clear coated to preserve the optical qualities that invite further investigation of the piece. Softening the visual crispness of the acrylic and stainless is a jacket of off-white wool that upholsters the shoulders and sides of the Trophy and if you look underneath there is a grey woollen felt base that completes the ensemble.